I am currently based in Amsterdam until sometime in mid-2012, but in February I have been in Athens for ten days, doing a few interesting things. 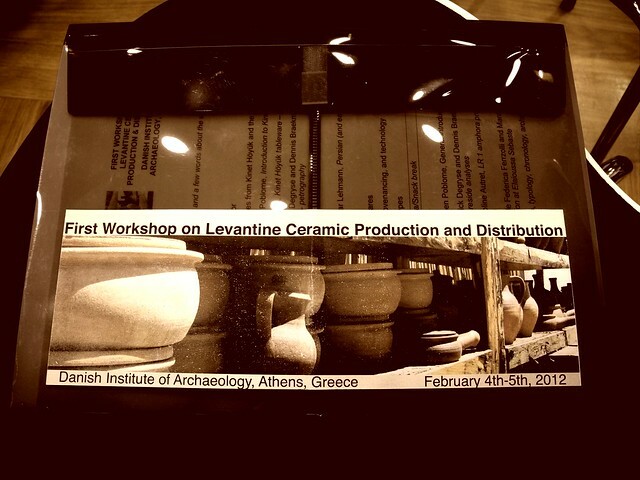 During the first weekend of February I’ve been attending the First Workshop on Levantine Ceramic Production and Distribution, organised at the Danish Institute of Archaeology in Athens. It has been incredibly interesting, first and foremost because bringing together ceramic specialists from the Bronze Age to the Ottoman period is priceless: the patterns of raw source materials, regional geology, spatial distribution of workshops, archaeological investigation of wares and fabrics are only artificially divided into rigid chronological grids and, for once at least, it was clear to everybody that it’s necessary to go beyond closed gardens in favour of a true longue durée (that was actually called for by the organisers on the workshop website). The Athens workshop was the first one in a series. Future workshops will take place once a year in different places. Instead of presenting notes from each talk, I have gone a bit further, summarising the topics that I found most interesting. I hope this results in a more readable account of the workshop. This section comprises summaries about some specific wares, based on all the presentations and the following discussion. Eastern Sigillata A (ESA) is the most prominent fine tableware in the (Northern) Levant in the Late Hellenistic and Early Roman periods, and it is widely found at Mediterranean sites in a much broader area. However, it is not alone. There is a variety of less widespread wares that share a lot in common with ESA. The so-called Black-Slipped Predecessor (BSP) is an earlier production than ESA, but there is a significant continuum between the late types of BSP and some early types of ESA that were fired in a reducing atmosphere, therefore black-slipped rather than red, and there is also evidence for half-red and half-black pieces resulting either from experiments or uneven firing conditions. However, there are differences in the manufacturing of the two, e.g. in how the slip is applied to the ceramic body: while BSP follows the standard Hellenistic approach of painting only the visible parts of the surface, ESA pieces were completely dipped in the slip-paint. Regional wares in the Levant include the Northern Coastal Fine (NCF), the Dry Red-Slipped (DRS) and Dry Brown-Slipped (DBS) and the Brown-Slipped. The classification of some or all of these wares is problematic, especially based on macroscopic observations of fabric, slip colour, surface treatment and finish. Petrographic and chemical analysis bring more data to facilitate a classification, but they are not always consistent between each other, and neither with the macroscopic classification, which is however a necessary first step. In Kinet-Höyük, for example, the 6 fabrics identified at a macroscopic level show little or no differences when analysed by petrographic means: there is no distinction between ESA and local tablewares (DRS, DBS). Results of neutron activation analysis (NAA) are consistent with this lack of distinction in the chemical composition of the various wares, but highlight differences in their homogeneity. BSP is for example less homogeneous, while ESA is at the other end of the spectrum being the group with less internal variability. Whether the degree of chemical homogeneity can be traced to the degree of standardisation in the production of these wares is a matter of debate. With regard to homogeneity, it should also be emphasised that it is generally invisible to the naked eye, and therefore it would have no meaning to the consumers of such products. The definition of Brittle Ware is usually reserved to the cooking, and more generally kitchen ware of Syria. The term is however not more suitable for the Syrian cooking ware than for other Levantine wares, which are sometimes thinner. It’s therefore advisable to speak of Brittle Wares in a more general fashion. There is for example a possible local production of Brittle Ware in Kinet-Höyük. Syrian Brittle Ware has specific types and fabrics, made in few workshops or production areas, and illustrated by a series of standard shapes mainly distributed in Syria (including Southern Anatolia and Southern Syria). There are different levels of information about Syrian Brittle Ware, resulting from the different degree of detail is has received at the sites where is was found. The most important sites, for which there is a large corpus of samples, are a small number: Apamea, Andarin, Dibsi Faraj, Hadir, Qalat Semaan. A distinction of the fabrics and of separate workshops is necessarily based on a combination of chemical, petrographic and binocular analysis, in a continuous integration among them. Furthermore, combining fabric analysis and distribution patterns of shapes has given an insight of the location of the production areas. Group 6: Early Islamic-Byzantine, has a highly chromed fabric. From the study of distribution patterns, it can be seen that the further from the production centre Brittle Ware goes, the lower the variability is in the distributed forms (i.e. standardised cooking sets travel farthest). Late Roman Amphora 1 (LRA1) is a transport amphora made in Cilicia, Cyprus and other parts of the Levant. A first survey of 13 kiln sites for this type was published in 1989 by Empereur and Picon, but it’s now outdated and it should include not only more sites but also other regions like the Dodecanese and Egypt. A number of workshops and kilns have been studied recently, including Elaiussa Sebaste, Sole-Pompeiopolis (Cilicia), Paphos, Zygi and Amathous (Cyprus). These workshops provide a more solid basis for the definition of fabric groups rather than finds from consumption sites. In Paphos and Amathous, the LRA13 type was produced at the same kilns. However, there are more fabric groups that are still unidentified, like the so-called “X fabric” (not to be confused with “workshop X” producing cooking pots, mentioned below), and as a result the correspondence between kiln sites and fabric groups is not always clear, or easily defined. At the same time, for the same amphora shape (i.e. a subtype of LRA1) we have a lot of variability in terms of petrographic properties. In Cyprus 5 fabric groups have been defined, only 3 of which correspond to kilns. The analysis of chemical data shows a difference between Cilicia (Yumurtalik/Ayas, Soli, Karatas, Arsuz) and Cyprus (Paphos, Amathous, Kourion). In this specific case, the comparison used was Sr (ppm) vs MgO (%). Overall, there are three main groups visible in any ternary diagram: mafic-basic, acidic-basic, bioclastic (with fossils). The mafic group is quite homogeneous, while instead the Ca-rich group is the most variable. LRA1 is usually assumed to be a wine amphora, based on knowledge about agricultural production in the regions where is was made. However, residue analysis performed on LRA1 body samples gave controversial results, in that only 2 amphorae had residues of wine, but 14 had traces of vegetable oil, and 23 of pitch. A correlated and interesting problem to the production of LRA1 is the relationship between amphora kilns and fine ware kilns, for which there is no conclusive hypothesis so far. Some petrographic analyses on samples from Kinet-Höyük gave results very similar to samples of other types from the same site. a second calcareous fabric, with red decoration on the rim, from sites in Lycia like Xanthos and Myra; this is a new proposal. John Lund showed a distribution map of micaceous and non-micaceous fabrics, based on chemical, petrographic and archaeological evidence. Polychrome Sgraffito is typical of the Late Medieval period. Despite being usually called “Port St. Symeon ware” (PSSW), it was actually made in many workshops outside the Hatay region. Paphos is an example of such a workshop, even though there is no correspondence between the fabric of this medieval pottery and the LRA1 amphorae from the same region. However, it is possible to draw a very general distinction between Cyprus and Cilicia based on chemical analysis. Polychrome Sgraffito is also definitely not “Crusader pottery”, as it is being used in Mamluk contexts. Written sources from the Crusader period mention pottery production in Beirut, Tyre, Jaffa and Acre. It is possible to draw loose links between the written sources and the archaeological evidence. Acre Ware consists of simple, unglazed vessels made on the wheel. Vessels were dipped in salt water before firing, that made them more resistant to breakage and less porous. Bowls were mass produced and possibly linked to the Hospitaller knights and their care-taking of pilgrims and sick. No workshop was found for Acre ware. Its production stops abruptly in 1291, but instead the beginning of production is interesting, because there is a significant similarity of forms with the earlier Fatimid pottery, in what seems to be a continuous tradition. This brings the question of who were the potters. Similar forms and surface treatments were found also in Caesarea, Apollonia and Jaffa. In Tiberias the jars are similar to Acre Ware, but in a different fabric. A similar production tradition, characterised by salt-water dipping, exists also in other areas, with different local fabrics. The pottery from Jaffa seems largely similar to that of Acre. A few wasters of glazed pottery were found in a recent excavation found. Apparently during the Frankish period two contemporary production traditions co-existed in the Southern Levant (Acre Ware, Beirut Ware) without any geographical distinction. This section is a general summary of the methodological issues in the study of Levantine pottery, particularly from the point of view of the different techniques of analysis. chemical classification (XRF, NAA, and others not mentioned during the workshop). Macroscopic archaeological classification relies mostly on the technique of production, and therefore depends on manufacturing techniques and firing conditions. Chemical analysis depends solely on the raw material and then provenance, even though it is not always possible to directly match the former to the latter. Care should be taken with post-depositional alteration, as occurs regularly underwater due to anaerobic bacteria. Petrographic analysis can target both kinds. Furthermore, microscopy can be used to see the structure of the fabric. All techniques have limitations, and for this reason a combination of them is always to be sought. differences in trace elements without any correspondence at the macroscopic level. Microscopic similarity among different productions from the same area, especially on a long-term perspective, is not necessarily the case. This can be explained by a variety of reasons, like changes in either the availability or the choice of source materials. Data resulting from chemical analysis are usually consisting of classified by means of well-established statistical procedures, such as clustering, and principal components analysis (PCA). Clustering can be displayed as a dendrogram, based on the Euclidean distances or on other methods for calculating distance in a multi-dimensional space. PCA is typically displayed as a 2-dimensional scatterplot, with colours or symbols representing archaeological classification of the samples. Sometimes there will be only a difference in the variability, i.e. the degree of homogeneity in one ware can be higher than in another, even though they were made using the same techniques and even source materials. The limited amount of samples that can be submitted for analysis, either petrographic or chemical, is problematic especially when there is no re-examining of the samples from an archaeological point of view. As such, it is important to choose samples that are well characterised based on their shape, decoration, degree of conservation, because they will be more useful. It is then very important to have a drawing of all sampled sherds. When available, a workshop should be the first step for defining a reference group, based on analysis of wasters and kiln furniture. If starting from scratch, it is advised to work on bigger groups first. Sometimes workshops are defined based on material from consumption sites, even before being identified in a specific region or site. However, consumption sites are more difficult to start with, especially in the case of large urban sites. A necessary step is an extensive survey of clay materials from the entire region under study, not only looking at geological maps, that aren’t generally detailed enough. This type of survey has been done in the Balearic Islands, in Sicily, in Kythera and partly in Crete. Based on interaction between archaeologists and archaeometrists, and sometimes on different traditions of study, it is sometimes confusing to compare works showing an inconsistent glossary between them. The description of fabrics at macroscopic and microscopic scale is the most critical. Not all specialists use the same standard for the description of fabrics and the photographs. This can cause dialogue problems between the archaeologist and the geologist. The term “ware” seems equally misunderstood. As such, it should be defined as a cultural term, based on either the fabric, the typology of shapes or the workshop. An optimal definition will be based on a combination of more than one aspect, but it is not always possible to obtain the desired level of detail. Petrographic and chemical groups do not necessarily match a ware on a 1:1 basis. When it is not possible to perform the necessary microscopic analyses, or their results are not conclusive, it is still appropriate to define a ware based on the typology of shapes, decoration and the manufacturing techniques, such as pot-making, surface treatment and polish, firing. The distinctness of a ware is a function of the local assemblage and not of the ware itself, so in different places a specific ware may be not distinct at all. “Source material” is a complex concept, as the manufacturing may be located significantly apart from it (e.g. 15 km), and more than one workshop may be using the same source material. As such, an identity between a certain source material and a workshop is not necessarily the case. It should be also pay more attention to the property regimes of the land where the clay sources were, because it is not always obvious that potters had access to clays only because they existed and were good for making pots. Strictly related to the definition of source material is also a classification of local, regional and imported products, a very important concept that is generally implicitly assumed as a standardised terminology. As an example, the following criteria were adopted for the Persian and Hellenistic Levantine Coastal Wares from Tel Kedesh. It is important to give an explicit definition of these concepts when using them, especially if they are used as a basis for an assessment of the economic and cultural value of pottery trade and exchange.